The University of Wyoming is among 20 sites nationwide selected to host an all-expenses-paid science camp offered to increase math and science interest among middle school students. This is UW's third year to host the prestigious program. 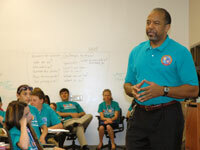 UW received an $80,000 grant from ExxonMobil Foundation and veteran astronaut Bernard A. Harris Jr. to support the ExxonMobil Bernard Harris Summer Science Camp June 17-26. Students who will be entering sixth, seventh or eighth grade this fall and reside in Wyoming, western Nebraska, northern Colorado or western South Dakota are encouraged to apply. The application deadline is April 13. Participants from previous camps are not eligible to apply. Interested students will need recommendations from their current math and science teachers, a 250-word essay, and high standardized test scores and academic grades. Campers will attend daily classes in the natural sciences, engineering, mathematics and technology taught by UW faculty members and secondary classroom teachers, who receive professional development training. Activities include classroom study, experiments, individual, team and group projects; weekly field excursions and motivational guest speakers. At the UW camp, students also will have an opportunity to use a professional telescope, the Wyoming Infrared Observatory on Jelm Mountain southwest of Laramie. "Wyoming is a great place to have a science camp because of our dark skies for telescope work and easy access to the outdoors," says camp Director Chip Kobulnicky, associate professor in the UW Department of Physics and Astronomy. "We see every year that this experience makes a huge difference in the lives of young people." UW's "Journey to the Stars" Summer Science Camp application is available online at http://wyomingspacegrant.uwyo.edu/AstroCamp.asp. For applications, program requirements and other information, contact the UW Department of Physics and Astronomy at (307) 766-2862 or email wsgc@uwyo.edu. "We are proud to sponsor the ExxonMobil Bernard Harris Summer Science Camps as they provide great building blocks to inspire students today to pursue math and science-based careers essential to solving the problems of the future," says Suzanne McCarron, ExxonMobil Foundation president. "Engaging them in middle school is critical in order to capture their interests as they begin to plan for high school and beyond." Harris is best known for his historic contributions to science as the first African-American astronaut to walk in space and a NASA researcher. Harris today dedicates himself to education initiatives that empower students to increase their science, technology, engineering and math skills through his organization -- the Harris Foundation.